Temperatures in Southern Nevada range from a low of about 25 degrees Fahrenheit (4 degrees Celsius) during the coldest winter nights to a high of over 115 degrees Fahrenheit (46 degrees Celsius) during the long hot summer days. - It is not unusual for temperatures to remain above 100 degrees Fahrenheit throughout the summer nights. As residents in our area of Southern Nevada do not have oil heating or natural gas available, most home heating is done with electric heaters or electrically operated heat pumps. - Cooling is acomplished with electrically operated air conditioners or heat pumps. As you can well imagine, under these circumstances, heating and cooling make up the major portion of monthly electric bills. To eliminate the need for grid electricity (commercially available electric service) we have explored and researched a number of alternatives. The most obvious alternative - solar panels with converters, regulators and batteries was quickly eliminated due to the high initial cost, high on-going costs, and, maintainance involved. Although possible, we found that we would have to purchase and install approximately 50 solar panels and numerous banks of batteries to keep a typical air conditioner / heat pump running day and night. As the solar panels only last 20 to 30 years at most and as the best batteries have to be replaced every 5 years or so, we decided that it just wouldn't be cost effective in the long run. Knowing that the temperature from about 6 to 12 feet (2 meters to 4 meters) below the surface of the earth remains fairly constant throughout the year, we decided to use this "geothermal" source to heat and cool our house. The first step was, of course, to determine the temperature at about 10 feet below the surface during the coldest months and also during the hottest months of the year. To do so (without sophisticated equipment), we simply dug a hole down about 10 feet deep and inserted an 11 foot long six inch diameter pipe into the hole leaving about 1 foot of the pipe exposed above ground level. We back-filled the area around the outside of the pipe and then attached a string to a meat thermometer and dropped it down the pipe until it reached the bottom. We attached the other end of the string to a cap that fit over the top of the pipe. Week after week throughout the course of about one year we removed the cap, quickly drew up the thermometer and noted the temperature. Day or night throughout the year we found the temperature 10 feet below the surface of the ground to be about 66 degrees Fahrenheit (19 degrees Celsius) - plus or minus 2 degrees Fahrenheit. Wow! - If we could move this 66 degrees Fahrenheit into our house during the winter we would only have to raise the temperature another few degrees to make it comfortable. Wow! - If we could move this 66 degrees Fahrenheit into our house during the summer we would have to open a door or window to make it comfortable. We investigated and researched existing and established types of geothermal heat pumps. - All appeared to be quite complicated. - Most required circulating water or some type of anti-freeze solution through an underground pipe and then using some type of expensive "heat transfer" apparatus to transfer the heat/cold to some type of heat pump / air conditioning system in the house. All of the existing geothermal systems also appeared to involve all sorts fancy electronic monitoring equipment and expensive installation. - All too complicated and expensive! We decided on a much simpler solution. - Put a long pipe 10 feet underground with the ends of the pipe coming into and out of the house. 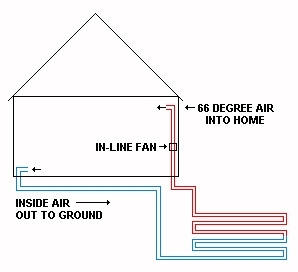 - Circulate the indoor air through the pipe with a simple electrical in-line fan. Diameter of pipe - Without going into a whole mess of technical physics type details we determined that the optimum diameter of pipe that allowed the maximum surface area to earth ratio was 6 inches (15 Centimeters). - You could use 8 inch pipe or 4 inch pipe but 6 inch diameter pipe appears to work best. Pipe Material - Metal pipe would probably transfer the heat/cold better but cost wise we determined that 6 inch PVC pipe was the least expensive pipe that would stand up under tons of dirt without being crushed. We also got the corresponding 90 degree "elbows" made of the same material so that we could tie each length or "run" together. Length of Pipe - The length of the pipe is, of course, most critical. - If it is too short the air flowing through it will not have enough time to cool off (or heat up) and if the pipe is too long you will have wasted your money. Again, without going into a whole mess of technical details, we have determined a rather simple formula for the optimum length of pipe necessary for any size house or structure. Formula - Multiply the square footage of your home by the height of the ceiling. - This gives you the total volume of area that you wish to heat / cool. Next, divide the total volume by 10. - The result gives you to total length of 6" pipe necessary. Example: A 3,000 sq. ft. house with 8 foot ceilings. Then 24,000 / 10 = 2,400. A 3,000 sq. ft. house with 8 ft. ceilings needs 2,400 feet of 6 inch pipe. Our test house happens to be approximately 4,000 sq. ft. with 10 ft ceilings. 4,000 x 10 = 40,000. ..... Then 40,000 / 10 = 4,000. We have now determined that, for our test house, we will need 4,000 feet of 6 inch pipe buried 6 to 10 feet underground. As our geothermal "pit" is about 100 feet away from our test house we have ordered extra pipe to cover the additional distance as well as to cover interior piping. - Note! - It is best to locate your geothermal pit as close to your house as possible. Figuring out the size, shape and depth of your geothermal pit is going to have to be up to you. It will depend on the length of pipe required, the size of your lot, etc. For our test house we unfortunately had to locate the pit about 100 feet away from the house. We determined that the best configuration for us would be a 110 foot long by 15 foot wide by 10 feet deep pit would work best. In this way we could put 10 rows of pipe 100 feet long in a layer at 10 feet deep, another 10 rows of pipe 100 feet long in another layer at 9 feet deep, another 10 rows of pipe 100 feet long in another layer at 8 feet deep, and, another 10 rows of pipe 100 feet long in another layer at 7 feet deep. This configuration would allow us to have a total of 4,000 feet of pipe buried between 7 feet deep and 10 feet deep and also allow for at least 1 foot of dirt between each run of pipe. Having decided on the location and configuration, we called a local back hoe service and had them dig the pit. in any manner whatsoever, in whole or in part without the express written permission of the publisher.